As the low-cost brand of Apollo Motorhome Holidays, Cheapa Campa offers campervans that have been retired from the Apollo fleet at reduced prices. Hires are available from eight depots throughout Australia and provide a great opportunity for parties of any size to explore the country at low cost. Choose from five models in the Cheapa Campa fleet. All models are between 3 and 6 years old and routinely serviced by knowledgeable staff. The interior of the vehicle is expected to be in a clean state at drop-off time, otherwise fees of up to AU$ 500 will be charged. The toilet and waste water tank must be emptied prior to the return of the vehicle and all fuel tanks (i.e. petrol, diesel and gas) need to be full, otherwise a further fee of AU$ 150 will be charged. All vehicles must be completely free of mud. Smoking is not permitted in any of the vehicles or a cleaning & deodorising process will be necessary at a fee of up to AU$ 300. This option can only be booked in advance and cannot be purchased on arrival. There are no long-hire discounts off these supplementary rates, however, the maximum number of days that you will have to pay the All Inclusive option is for 50 days. You can see the price for this option during the online quoting / booking process on our website. A 5% discount applies to all rentals that are booked at least 90 days before travel and between 19 Mar 19 by 30 Jun 19. 21+ days hire = 9% for bookings made between 19 Mar 19 and 30 Jun 19. The discount does not apply to the All Inclusive surcharge, only to the standard rates. - The payments made for the All-Inclusive option (can be booked in advance) and the excess reduction insurance options (available on pick-up) are still calculated individually, i.e. rental by rental. - The one-way fee in Australia is charged for each individual rental. The flex rate that is available at the time of booking for the first rental day determines the daily rental rate for the entire rental period up to the 7h day. Every rental day from the 8th day on are counted as a new booking and the flex rate that applies for the 8th day will be used from then on. The flex rate that applies for the 15th rental day will be used from then, etc. If the vehicle is collected later than the pick-up day booked, or returned earlier than booked, no refunds will be provided. There are also no refunds provided if the booking is shortened within 14 days of the pick-up date. - AU$ 165 one-way fee. Please refer to the 'Driving Restrictions' section for information on the minimum hire period that applies to one-way rentals. 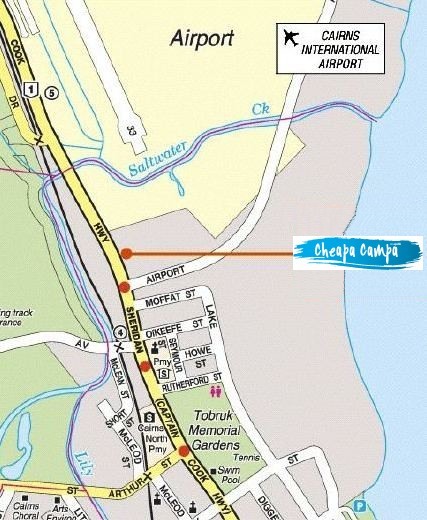 One-way rentals (= pick-up at location 'A' and drop-off at location 'B') between all Australian depots and in all vehicle categories are possible on request with your booking - except for the rental depot in Broome. Rentals from/to Broome are only possible with the 4WD Camper and 4WD Trailfinder. The one-way fee is AU$ 165 and will be charged locally. The one-way option is allowed as long as the minimum hire condition is achieved. A table outlining the minimum hire conditions can be found below under 'Driving Restrictions'. A surcharge of AU$ 750 applies if you pick up and/or drop off your vehicle in Broome. This surcharge is always charged in addition to any one-way fees that may apply. Cheapa also offers an Extended Roadside Assistance for AU$ 7 per day (max. AU$ 175 per hire) which covers damage to 1 windscreen and 2 tyres in additon to the inclusions mentioned above. Please note that basic Roadside Assistance is always included in your rental package. In case of a breakdown, you will receive assistance even if you do not buy supplementary Roadside Assistance. However, the extra services listed above are only available if you purchase supplementary Roadside Assistance coverage and will incur a minimum AU$ 100 call-out fee with the standard program. Baby / booster seats can be hired from Cheapa Campa and cost AU$ 35 per seat and rental. If you book the All Inclusive option with us, these seats are included in the total price (pending availability, if requested with the booking and as long as the seats are suitable for the vehicle in question only). Please note: Baby / booster seats cannot be fitted to the vehicle types Hitop, 2-Berth motorhomes or 4WD vehicles. If you have a baby between 0-6 months of age you cannot rent a vehicle from Cheapa as they do not allow baby capsules to be fitted to any of their vehicles. The local GST and the 3% administration fee are included in all payments made to us. For all amounts payable locally in AU$ the following sales taxes are charged on top of the base price: 10% GST, 3% administration fee. We have sought to provide accurate information on taxes. However, we do not accept responsibility for any changes such as new additional fees charged by the rental company at pick-up time or local tax increases made by the local or federal Australian government. The standard insurance with insurance cover up to AU$ 10 million and an excess of AU$ 3,500 (Hitop, Endeavour and 2-Berth vehicles), AU$ 5,000 (4- and 6-Berth vehicles) or AU$ 8,000 (all 4WD vehicles) per incident is included in the rental rates. This provides cover for damage to the rental vehicle or to third-party property. The renter and passengers are not insured for bodily damage to themselves as there is no passenger insurance provided by Cheapa. The renter's excess that comes with the standard insurance is AU$ 3,500 (Hitop, Endeavour and 2-Berth vehicles), AU$ 5,000 (4- and 6-Berth vehicles) or AU$ 8,000 (all 4WD vehicles) per incident for any property damage incurred by a third party or the rental vehicle, regardless of how the damage occurs or who causes it, which includes accidents that are no fault of the renter. Any damage to the windscreen or tyres will need to be paid by the renter in full. In Australia third-party insurance is not compulsory. Therefore, in the event of an accident involving an uninsured driver or if a third party flees the scene of an accident the renter will be liable up to the level of the excess even if he/she is not at fault. *Tyre damage or damage to the windscreen as well as to awning, overhead or underbody have to be paid by the renter in full. The respective excess is payable for any damage to the rental vehicle including damage to third party property, in the event of theft, fire, break-ins, vandalism as well as loss of revenue incurred by Cheapa if the vehicle is unable to be rented out due to necessary repairs. With the standard insurance the deposit, which covers the amount of the excess of the insurance option you have chosen, is deducted from a credit card at pick-up. Visa, Mastercard, American Express and Diners Club cards are accepted. Pre-paid credit cards, travellers cheques or cash will not be accepted. If you take just the standard insurance, the deposit will be deducted from your credit card and fees of 2% will be charged in addition to the deposit amount if you use Visa or Mastercard. For American Express or Diners Club cards, fees of 2.8% will apply. These administration fees are non-refundable. If you choose the Liability Reduction Option 2 (VIP Cover) at pick-up time or you purchase the All Inclusive Option with Motorhome Bookers in advance, the deposit of AU$ 250 (or AU$ 500 for 4WD campers) will be charged. If the vehicle is returned without damage or third party incident the full amount of the deposit will be reimbursed. Any changes in foreign exchange rates or fees are borne by the renter. All credit card deductions are made in Australian Dollars. Neither the rental company nor the tour operator is liable to make up any differences that occur between the cost of a deducted deposit and the reimbursement which result from foreign exchange fluctuations or external fees. If an accident occurs, the deposit banked to cover the excess in the first instance regardless of who is at fault and is owed to the rental company by the renter even if the damage was not caused by you and is refunded as soon as the rental company receives a payment from a third party. This can of course take some time. In Australia, third party liabitily insurance is not compulsory. If you have an accident with an uninsured driver or the other person flees the scene of the accident you will be liable for the sum of the excess. The excess applicable for the insurance options mentioned above apply to each individual incident and not on a per-rental basis. If a second accident occurs, a further deposit of the same total will be payable. All insurance cover is null and void if the terms of the Cheapa Campa Australia rental agreement are breached. Any damage that is caused when the renter acts outside of the rental company conditions is not covered by the insurance. Any damage resulting from a violation of traffic regulations is also not covered by insurance. All credit card payments that you make locally at the rental company depot are made in Australian Dollars. These fees are non-refundable and apply on top of the respective deposit. But in case you booked the All Inclusive Option with Motorhome Bookers in advance and the rental vehicle is returned in the same condition as you picked it up the credit card fees for Visa and Mastercard will be reimbursed. For security reasons, Cheapa will only accept credit card or debit card for rental/extras charges paid on vehicle pick-up or drop-off. Cash payments will not be accepted at any branch. The bond is only payable at pick-up by credit card or debit credit card and cannot be paid with a pre-paid credit card. Cheapa requires a national driving licence, which must have all details listed in English. If the important details on the national licence are not in English, you are required to bring a valid international driving licence. An accredited English translation will be accepted in lieu of an international driving permit. Photocopies are not enough. Every driver is required to have held a valid and full driving licence for at least 2 years prior to the pick-up date. The driving licence must be valid for the entire duration of the rental. The minimum age for the renter and other registered drivers is 21 years. Additional drivers can be registered at pick-up time for a fee of AU$ 3 per rental day and driver (max. AU$ 45 per rental and driver). This is free with the All Inclusive option. Anyone wishing to drive the motorhome must have their details entered in the rental agreement. Please note carefully the maximum number of passengers allowed per vehicle as per the details provided when you click on the picture of your vehicle and view the vehicle specifications on our website. Please also inform us if there is a change in the number of people travelling in your party. clothes pegs and clothes line, dustpan/brush, fire extinguisher, bucket, fresh water hose, broom. Kitchen equipment: plates, cups, glasses, knives, forks, spoons, bowls, pots, pans, colander, bottle / can opener, cutting board, cooking utensils, teapot, toaster, tea towels, etc. Provided in Cheapa 4WD Camper and Cheapa 4WD Trailfinder only: satellite safety beacon. A first-aid kit is provided in every vehicle. If the seal is opened and you use it the kit becomes your property and AU$ 50 will be charged for it at drop-off. - Camping chair: AU$ 17 per chair per rental. The gas cylinder can be returned empty when you return the vehicle. Baby seats and booster seats are compulsory in Australia for children up to 7 years of age. Seats that are only attached to the frame of the vehicle (such as the middle seat in the front of most motorhomes) are illegal. It is not permitted to use child seats from UK/Europe or other countries that do not have the appropriate connection apparatus for motorhomes. Children under the age of 4 are not permitted to sit in the front of any vehicle. You can rent baby seats (suitable for children between 6 months and 4 years old) and booster seats (normally suitable for children 4 - 7 years of age and/or 14 to 26 kg weight) for AU$ 35 per unit per rental. This is a one-off payment and is valid for the entire rental period. Baby and child seats must be booked in advance. If you book the All-Inclusive option with us these seats are included in the total price (must be prebooked, pending availability). Please provide us with the age(s) and weight(s) of your child(ren) when you make your booking so that we can book the appropriate seat for you. If you have a baby between 0-6 months of age you cannot rent a vehicle from Cheapa as they do not allow baby capsules to be fitted to any of their vehicles. According to Australian law, baby and booster seats have to be fitted in the rear of the vehicle and are not allowed on the front seats. All non-4WD vehicles are permitted only for use on sealed/bitumen public roads and driveways/access ways of up to 12 km (e.g. to campgrounds). There is no insurance cover if you drive on unsealed terrain and you will be liable of any damage incurred if you do so. The 4WD vehicles can be driven on recognized unsealed roads or tracks as long as these are included on maps, are sign-posted and clearly recognisable. There are certain areas where you are only permitted to drive with the written permission of Cheapa Campa - for example: any Islands, including Tasmania but excluding Fraser Island and Moreton Island, Simpson Desert, Cape York (north of Daintree River), Oodnadatta Track, Mereenie Loop, Birdsville Track, Tanami Track, Gibb River Road, Kalumburu Road as far as Drysdale Station only, Warburton Road, Strzelecki Track, Mitchell Falls/Plateau, Cape Leveque, Bungle Bungles, The Plenty Highway, Burke Development Road from Chillagoe to Normanton and Savannah Way from Normanton to Borroloola, Finke Road, Bloomfield Track, North of Cape Tribulation and other remote areas. Even if you have written permission, special 'Remote Area' conditions apply. This means that in the event of an accident or breakdown in a remote area it will be the renter's full financial liability to pay any salvage, towing and/or recovery costs to the nearest Cheapa Campa depot. No replacement vehicle will be provided under any circumstances. Please contact the Cheapa Campa fleet department within 24-48 hours of travel to the restricted are in order to request permission. No vehicle is permitted for use on Fraser Island, Moreton Island, the Canning Stock Route, Lost City in Litchfield Park, Gunbarrel Highway, the Old Telegraph Road section of the road to Cape York, Cape York between 01 Dec - 31 May, Boggy Hole (Finke Gorge National Park), the Old South Road from Maryvale to Finkea, the last 2 kilometres of the Lennard River Gorge Road and the Central Arnhem Road. Anyone who drives in these areas is also uninsured and the entire risk is borne by him-/herself. Cheapa Campa reserves the right at its sole discretion to restrict vehicle movement in certain areas due to adverse road or weather conditions and the distance to nominated destinations in relation to the length of the rental period. 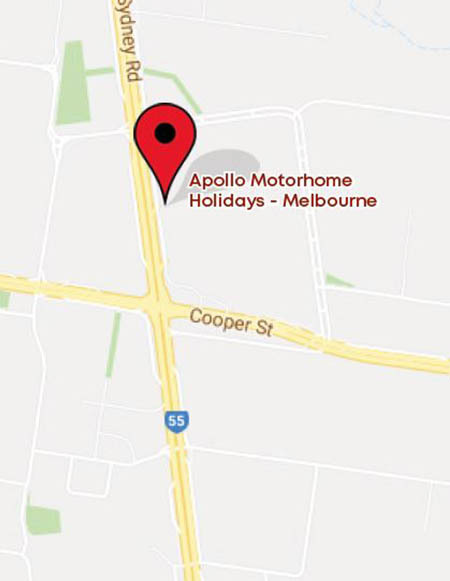 One-way rentals (= pick-up at location 'A' and drop-off at location 'B') between all Australian depots and in all vehicle categories are possible on request with your booking. 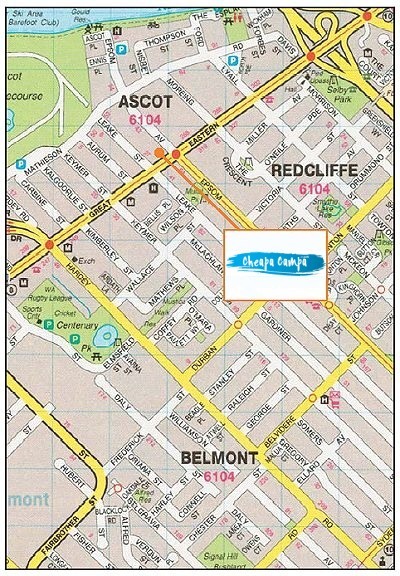 Therefore one-way fees of AU$ 165 will be charged and are payable locally. All branches are closed on 19 Apr, 25 Dec, 01 Jan, 27 Jan. NOTE: If your return flight is at midday or earlier we recommend that you drop off your motorhome at the depot on the day before your flight and spend the night in a hotel (or similar). You can only extend the hire with prior approval from the rental company at the standard rates. This rate is normally higher than the Motorhome Bookers rates and is payable immediately locally by credit card (via the phone or at a Cheapa rental depot), not at drop-off time. If it is returned later than the agreed drop-off date without Cheapa being made aware of the extension the renter will be charged at a higher rate for those days (double the daily rate and if the depot is not the agreed drop-off location further transportation fees will be charged). You can also only change the drop-off depot with prior approval from the rental company. Otherwise, one-way fees as well as additional surcharges of at least AU$ 700 will apply. Cheapa Campa does not provide transfers. The rental company reserves the right to charge a fee of up to AU$ 500 if the interior of any returned vehicle is extremely dirty. Toilets and waste water tanks (if the vehicle is equipped with these) must be completely emptied, petrol or diesel tanks must be full, otherwise a further fee of AU$ 150 will be charged. All vehicles must be completely free of mud. Smoking is not permitted in any of the vehicles or a cleaning & deodorising process will be necessary at a fee of up to AU$ 300. In the event of an accident, breakdown, technical difficulties or if other problems occur you are required to inform the rental company immediately and within no more than 24 hours. A nationwide network of contracted mechanics are available in such cases. In addition, Cheapa Campa has a 24-hour toll-free phone service which is available every day of the week. All Cheapa vehicles are also registered with the Australian Automobile Association (AA). Small repairs or expenses required for the upkeep of the vehicle up to AU$ 100 can be carried out without prior communication with the rental company and will be reimbursed to you at vehicle drop-off time. For repairs that will cost more than AU$ 100 you are required to notify the rental company before repairs take place in order to obtain their approval to proceed. Repairs can only be reimbursed upon presentation of a receipt. Note: If you do not inform Cheapa Campa immediately about the need for a repair and if Cheapa Campa is not given the opportunity to help you and find a solution no reimbursement or compensation can be provided. Pets (dogs only) are allowed in the vehicles with prior and written notice for a fee of AU$ 200. Service dogs are allowed without any costs. Smoking is not permitted in any of the vehicles or a cleaning & deodorising process will be necessary at a fee of up to AU$ 300. All information provided has been compiled by us (Motorhome Bookers Ltd) in as much detail as possible and on the basis of the information made available to us. This information has been taken from the rental company's conditions which they have provided to us. Additional conditions form a component of the rental agreement which is entered into by yourself and the rental company. You will receive the complete list of rental conditions with your rental agreement, which you sign when you collect your vehicle. We accept no responsibility for any differences that may come to light between our list of conditions and those of the rental company.